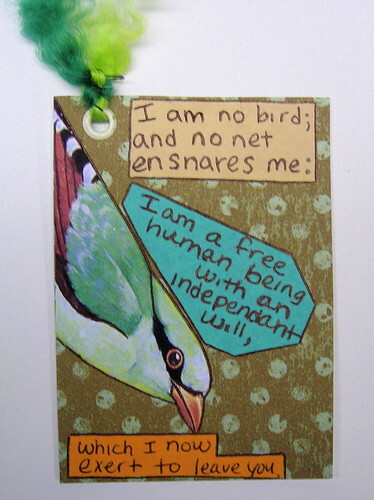 I have been working on lots of things the past couple of weeks for both my shop and for swaps. A few projects I made for my Etsy shop sold fairly quickly, but I didn’t get a chance to write about them when they were new! I have had an obsession for lamps lately, so I knew I had to try and paint on one. I found these little table lamps at a local store, which came in a rainbow of different colors. Right away I fell in love with the teal blue and wanted to paint a bird on it. I was also curious about how lamps would do online. 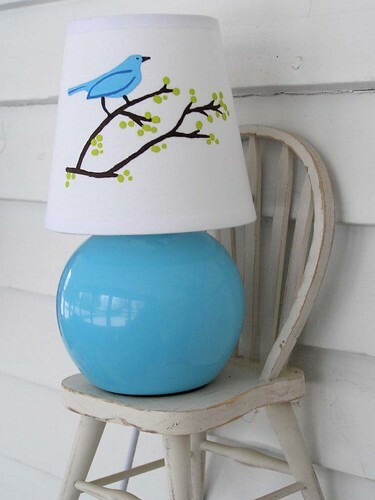 I have a few more of these lamps to paint on in lime green, banana yellow and red. Here is my “On a Limb” mini lamp. Total height with base and shade is 7.75 inches. 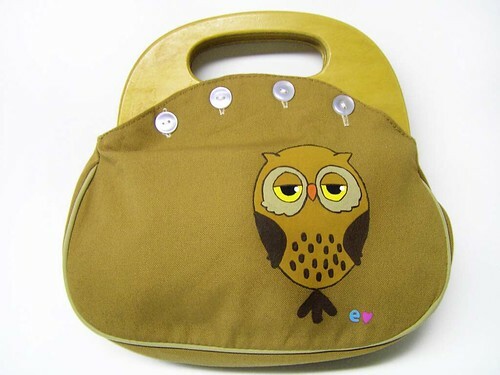 I also introduced a new forest friend, Oakley the Owl. I had this cool retro handbag waiting around for the right thing to paint on it. 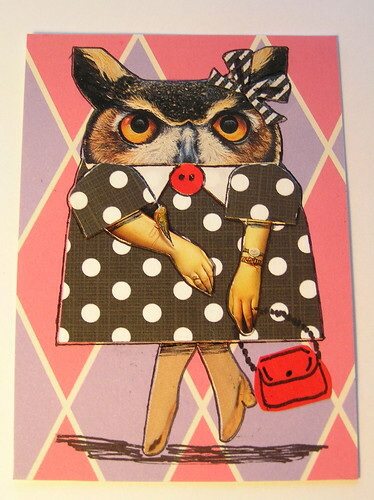 I’m happy that owls are starting to come back in style! I thought Oakley went well with the wood handles. Lastly, I felt was due for a painting, as its been ages since I had done one. Sometimes its just refreshing to paint on plain canvas rather than a purse. I had this 5 x 7 canvas and some ribbon I was saving for something special. I decided on painting a geisha, with a modern feel. I love bright colors and lime and pink seemed like a nice combination to use for her kimono. 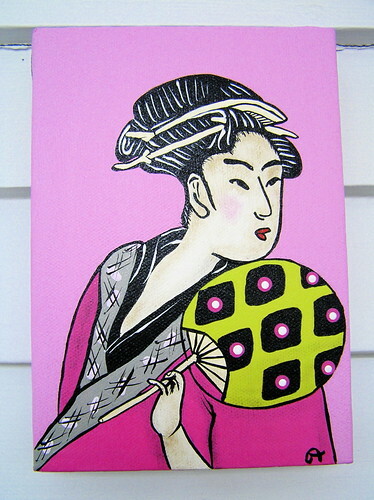 The sides of the painting were covered with grey and pink polka dot ribbon, to match the accents on the kimono. 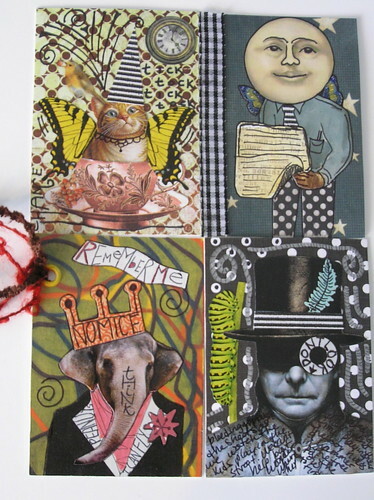 I have been having a blast creating and trading artist trading cards on Craftster , ATCards, and on Flickr. I have found that paper crafts are just as addicting as painting! 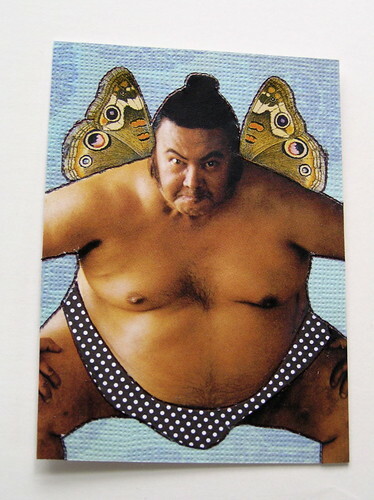 If you’ve never tried making an artist trading card, its a great way to get your creative juices flowing. 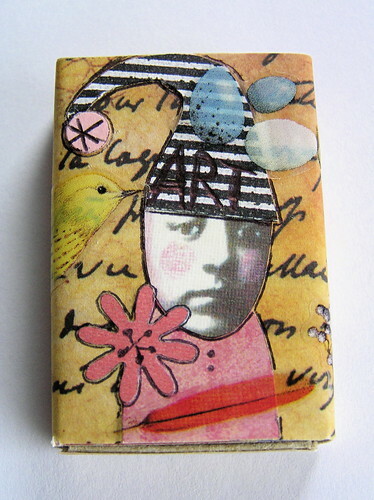 You can find out more information about ATCs at the Craftopedia at Craftster.